You are looking at a picture of a few spring chocolate candy lollipops. This easter chick and duck and easter egg are handpainted in any colors that you choose. This candy is made from fresh chocolate. You will receive one lollipop of your choice. 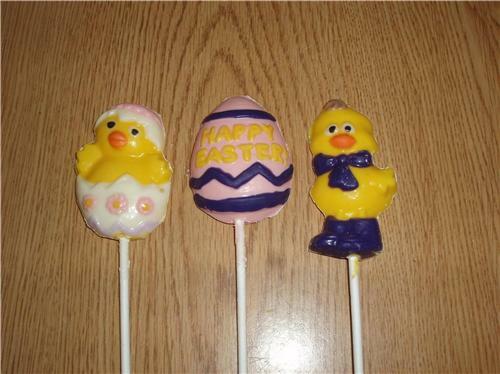 These easter lollipops would make great gifts for someone or for an easter basket or wonderful party favors. This candy is made fresh to order and comes in bag tied with a pretty colored ribbon.